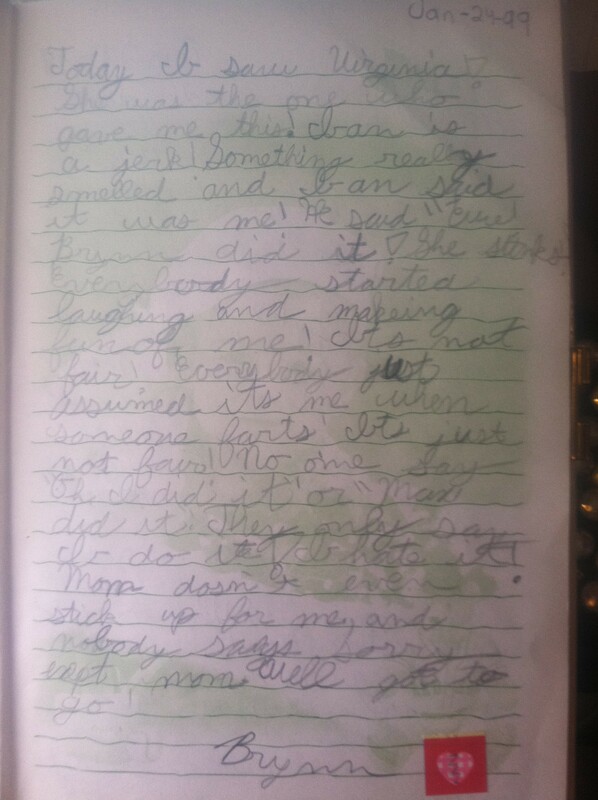 Below is a real excerpt from my diary in January 1999…that makes me almost 10 years old. And this, my friends, is what I wrote about. It was obviously quite traumatic. I still struggle with this problem in my family. My boyfriend is now the main accuser…you know what they say about cycles of abuse. This is proof that Ian, age 3, was just the worst. Not the worst brother…just, the worst. Why did I write this in cursive?? My handwriting really hasn’t improved since. Seriously ten-year-old-Brynn, was this really diary-worthy? This is the first of a grand total of four entries in this particular diary…all gems. Can I just note that I didn’t deny it? What did you write about in your diary? LOL! hilarious. This is obviously traumatic, thus making it diary-worthy. I, too, can sympathize with the MCS (middle-child syndrome). It’s the worst and very, very real. As to the cursive curiosity, ten years old would put you in fourth grade. And you start learning cursive in third grade and are required to use it in fourth. At least that’s how it was at my school. i can attest to Brynn’s smelly farts, especially in 2009, a few weeks before we found out that she is slighty lactose intolerant, but she is better now. I’m in tears of laughter. and…… “I’m sorry” again. Hey? at least there’s proof in your entry that I’m the only one who says sorry?